Big news from Thompson Street: Rich Torrisi and Mario Carbone have scrapped plans for their Lobster Club sandwich shop in favor of a reservations-only raw bar opening next weekend. The twelve-seat spot is called ZZ’s Clam Bar — ZZ being the nickname of partner Jeff Zalaznick. “What happened was that after months of testing, we ate so many lobster club sandwiches we didn’t even want to look at one anymore,” ZZ explained. 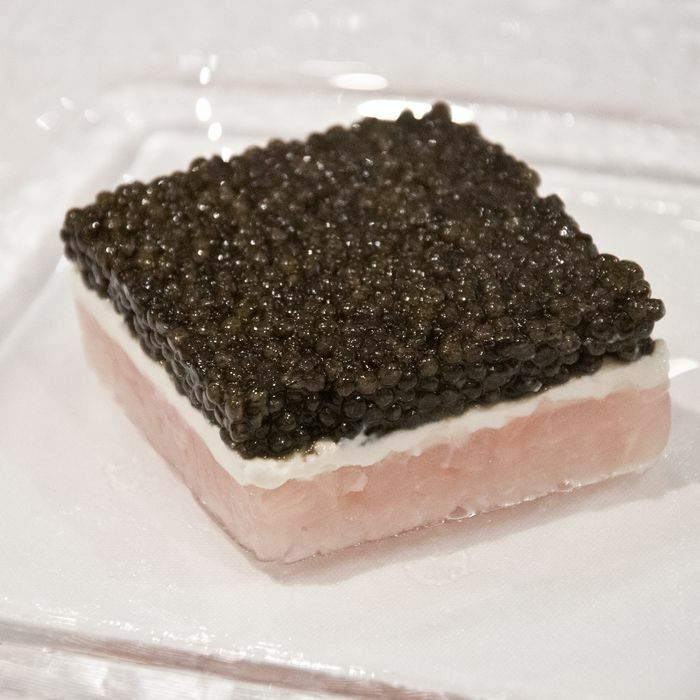 What Team Torrisi decided they’d never grow weary of gazing upon, though, are artfully composed seafood crudo dishes, such as striped-horse-mackerel tartare with whipped ricotta and caviar (pictured). A dozen of these raw-fish preparations will compose ZZ’s menu, along with oysters and clams on the half-shell. To wash it all down, Carbone barman Thomas Waugh has concocted a slew of inventive cocktails including one served in a frozen coconut.